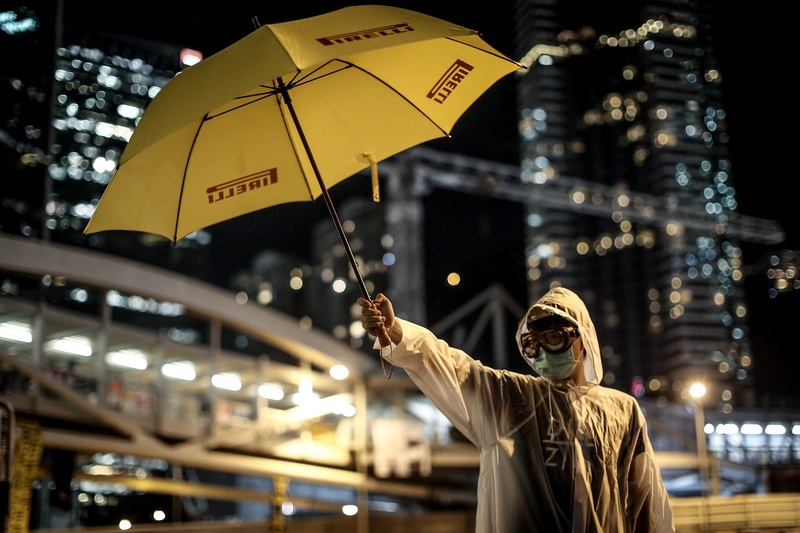 A protester holds up a yellow umbrella on a street in Hong Kong, November 7, 2016. Hong Kong police used pepper spray on November 6 to drive back hundreds of protesters angry at China’s decision to intervene in a row over whether two pro-independence lawmakers should be barred from the city’s legislature. Given the political earthquake that occurred on November 8, the recent political and constitutional crisis in Hong Kong now seems comparatively diminished in significance. At the time, however, it was widely seen as—and continues to be—a major challenge for both the Chinese Party-State and the Hong Kong local government. If anything, the magnitude of that challenge has increased since the U.S. election, given the turmoil a Trump presidency could generate abroad. There are, in fact, a number of common themes among the election of Donald Trump, Brexit, and the unyielding stance Beijing has taken towards Hong Kong political activism over the past few years: all three are largely products of rising nationalism. While the role nationalism and anti-globalization sentiment have played in recent U.S. and British politics has been covered ad nauseam, analysts have often overlooked the ways in which Chinese nationalism—popular nationalism, as opposed to government-sponsored patriotism—shapes and, in many ways, constrains the ruling Communist Party leadership’s political tactics. The failure to understand and account for mainland nationalism is perhaps most evident in the political strategies pursued by the Hong Kong democracy movement, many of which have been self-defeating for precisely this reason. The episode reinforced the common belief among mainlanders, and outside observers, that Hong Kong activists are at least partly motivated by anti-mainland bigotry. Mainland netizens swiftly drew comparisons between the oath-swearing incident and the inflammatory rhetoric employed by some Occupy Central protesters in 2014, which compared mainland migrants and tourists to “locusts” eating away at the social and economic foundations of Hong Kong. When China’s rubber-stamp National People’s Congress responded on November 7 with an aggressive interpretation of the city’s governing Basic Law that essentially barred all Hong Kong legislators from taking office if they failed to properly swear allegiance, WeChat and Weibo, the Chinese equivalents of WhatsApp and Twitter, exploded with approval. The continued entanglement of the Hong Kong democracy movement with anti-mainland bigotry may make some amount of political sense; it allows the movement to draw support from sectors of the local population that would not otherwise be sufficiently interested. Raw xenophobia, as recent developments in Western politics demonstrate all too clearly, can be an extremely powerful motivator, especially for populist movements that lack elite sponsorship and ideological coherence. It may very well be true that, but for its appeal to the uglier side of Hong Kong localism, the city’s democracy movement would never have gotten off the ground in the first place. But if the movement’s goal is to win any real institutional victories, and not just vent frustrations and galvanize youth, then an anti-mainland angle is ultimately self-defeating. Beijing cares far more about sociopolitical stability on the mainland than in Hong Kong, which is, after all, only China’s 18th most populous city. What many activists and Western commentators do not seem to understand is that Beijing cares far more about sociopolitical stability on the mainland than in Hong Kong, which is, after all, only China’s 18th most populous city and its third largest urban economy. Especially under the “one country, two systems” superstructure, which officially allows Hong Kong a separate political and economic system until 2047 and requires those passing between Hong Kong and the mainland to present their passport, the Party’s rule is almost completely unaffected by the degree of its support there. Obviously, the opposite is true for Party popularity on the mainland. The more Hong Kong democracy activists employ anti-mainland rhetoric, rather than anti-oppression or anti-autocracy rhetoric, the more they provoke nationalist fury among the mainland population, and the more Party leadership is able to reap political gains from a hardline stance. If the cost of shoring up popular support on the mainland is merely a period of heightened political tension in Hong Kong—which, after all, has no realistic path towards democracy without Beijing’s consent, and zero chance of independence—then that is a bargain Party leaders are likely quite willing to make. One could argue that Party leaders are—or should be—wary of damaging Hong Kong’s status as a global financial center. But if the relatively muted financial reaction to Occupy Central is any indication, Hong Kong’s attractiveness as a financial hub does not necessarily depend on warm relations between Chinese policymakers and the local population. Financial markets rely more on institutional predictability than on government popularity; the two are sometimes correlated, but not necessarily so. In fact, a consistently hardline position by mainland policymakers in a secure position of political dominance may actually offer more institutional predictability and stability than a more accommodating but potentially ambiguous position. That calculus could change if Beijing begins to actively interfere with the operation of Hong Kong’s financial institutions, but at present, there is no discernible danger of that. Mainland Chinese nationalism can be a fickle thing, but if there is anything predictable about it, it is the consistency with which it lashes out at perceived disrespect by foreigners or outsiders. Western media often mocks the frequency at which the Chinese government accuses foreign entities of “hurting the feelings of the Chinese people,” but there is, at least in recent years, an element of truth to the claim. As nationalist sentiments gain traction among younger generations, there is a stronger likelihood that perceived disrespect by foreigners—or, even worse, by residents of Hong Kong or Taiwan—will in fact “hurt the feelings” of large portions of the mainland population. When that disrespect seems to come from within, especially from Hong Kong or Macau, then the backlash from the mainland is usually furious and unrelenting. Chinese nationalism draws, above all, on a narrative of humiliation and victimhood extending from the Opium War in 1840 to the founding of the People’s Republic in 1949. In this narrative, the “century of humiliation” is presented as a “never again” moment in Chinese history, a nadir from which the country must constantly struggle to recover. Even more than the glorification of China’s cultural traditions or historical dominance, the shared memory of shame and weakness in the recent past constitutes the cornerstone of Chinese sociopolitical consciousness, supplying both a foreign “other” to unite against, and a set of objectives to pursue: national unity, material wealth, military power, and ultimately international respect. For older Chinese who experienced first-hand the material and political challenges of the Mao era, wealth and stability likely remain central concerns. Younger mainland Chinese, however, may have a tendency to take the wealth and stability of the past 25 years for granted. They are therefore particularly keen on foreign respect, and particularly hostile to the perception they aren’t getting it. When that disrespect seems to come from within, especially from Hong Kong or Macau, then the backlash from the mainland is usually furious and unrelenting. Hence the incentive for Party leadership to adopt hardline positions against Hong Kong’s democracy movement. In fact, had Beijing been accommodating, it might actually have risked significant instability on the mainland. One can easily imagine the following scenario: following grants of greater autonomy and democracy to Hong Kong, nationalist intellectuals on the mainland begin to compare these grants to the 19th century extraterritorially a vanquished Beijing gave to foreign powers. They could argue that not only had the Party leadership shown weakness, but it was also creating different levels of citizenship. “Why do they deserve democracy, but we do not?” is a powerful accusation, one that could spark widespread resentment among the mainland urban population and sow the seeds for unrest. Compared with ongoing unrest in Hong Kong, that would be a far more dangerous outcome. As these thought experiments suggest, nationalism can be a source of legitimacy and popularity for the Party-state, but also a constraint. It rewards, and in many cases demands, aggressive foreign policy, even when the Party leadership may not necessarily want it. Take, for example, the 2008 demonstrations against foreign coverage of Beijing’s summer Olympics: the widespread public furor over “biased” reporting by CNN and other Western media outlets was a major source of anxiety for Party leaders who desperately desired a smooth and glamorous Olympics. Compared to that relatively mild episode of nationalist mobilization, the Party’s handling of Hong Kong is a far more volatile and politically dangerous issue, especially when the Party’s other major source of popular support—economic growth and increased living standards—is becoming somewhat less reliable. So long as the Hong Kong democracy movement remains a prominent target of mainland nationalism, Beijing has very little incentive to compromise. What does this all mean for Hong Kong’s democracy movement? If it truly wants real institutional change, then at the very least, it needs to detach itself from the uglier parts of Hong Kong localism and reject anti-mainland xenophobia in clear terms. Ideally, it would want large portions of the mainland population on its side, perhaps by appealing to common frustrations over free speech, or even political representation. This would be a very tough sell, given current animosity between the two sides, but probably not an impossible one. Chinese nationalism has always reacted poorly against foreign claims of cultural or political superiority, which triggers perceptions of disrespect and derision, but there is very little evidence that it is innately hostile towards democracy. As a recent academic article suggests, it tends to correlate strongly with support for a strong state and wariness of the West, but not nearly as strongly with hostility towards democracy or free speech. Mainland nationalism is, at its core, a reactionary sentiment, and therefore ideologically malleable. Like other forms of nationalism, it necessarily defines itself against foreign “others.” But there is no reason why Hong Kong necessarily has to be an “other.” Quite to the contrary, mainland nationalists may feel irritated or even betrayed by Hong Kong’s perceived refusal to reciprocate their beliefs in shared ancestry and common political identity. Therein lies the source of current resentment, but also, potentially, of future reconciliation.